US stocks aren't the only things going for cheap lately. Apparently, the soft economy is also affecting lobster pricing - and it's lower now than ever. Curse my bad luck - my doctor just told me I have high cholesterol - so I should probably be cutting down on the seafood. Over the past six months, the price local lobstermen are earning for their catch has plummeted -- dropping from about $6 a pound in the spring to less than $3 now. At the same time, the cost of diesel and bait has surged. Eddie Hook, owner of the Boston-based wholesaler James Hook & Co., said he can't remember the industry facing such dire straits. He's now selling lobster -- at the downtown location that burned down this year -- for $5.99 a pound, down from $7.99 a pound a few weeks ago. Lobster mac and cheese, lobster rolls, lobster with ginger and scallion ... I'm drooling on my keyboard a little. 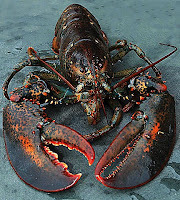 1 Response to "Cheap Lobster for Everyone"
ummm.... seafood is excellent for high cholesterol! That is unless you slather it in butter and deep fry it.